German Shorthaired Pointers for the Hunter and Family. 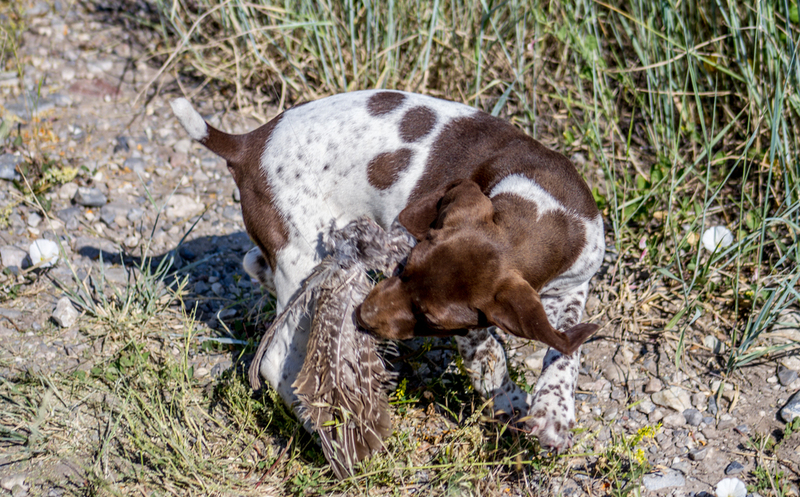 Aspen, owned by David K. Working some Arizona Quail. "Aspen" from the Fall 2015 Zoey x Zeke litter. Owned by David K. and Family. Doing a little work with quail. Another good lookin pup from the Fall 2015 Zoey x Zeke litter, owned by Casey M. and Family. "Zoey" (Named after her mom, very cool!) from the Fall 2015 Zoey x Zeke Litter, owned by David B. and Family. "Puddles" was one of our highest prey drive males from the Spring 2015 Zoey x Zeke litter. "Daisy" is the pup in the foreground, she went to our hunting buddy here locally so we are looking forward to seeing more of her and shooting some birds over her this fall! Puddles doing what he does best. "Puddles" on the right, "Spike" on the left. This was an impressive litter. Another awesome shot of "Puddles" and his sister. "Mack" was a very large male from the Spring 2015 Zoey x Zeke litter. He exhibited exceptional prey drive and style. His name came from the distinct "M" on his right side. "Ziggy" was the whole reason for the Spring 2015 Zoey x Zeke litter. She's staying with us! Look for big things in the future from her. "Pippin" was another awesome pup from the Spring 2015 Zoey x Zeke litter. Spike was a pup from the Spring 2015 Zoey x Zeke litter. His markings and coloring is a near clone of his mom Zoey. © Copyright 2010-2018, Photography by Steady to Wing & Summers Creative, Content by Steady to Wing, All Rights Reserved.